Christmas is a special time of year in Bel Air. There is so much to see and do and the historic charm of downtown Bel Air is apparent everywhere you look. From stores fronts wrapped in evergreens to captivating lights at Town Hall and Rockfield Manor, nothing beats the small town feeling in Bel Air this time of year. The holiday season officially gets kicked off on Thanksgiving with the start of free parking in the Bel Air Parking Garage which will last until December 31st complements of the Town of Bel Air. That will give you plenty of time to visit all of the shops and boutiques as well as get together with friends at on of the many restaurants throughout the District. Why not start your shopping on Small Business Saturday November 24th? Once you have hit all the local boutiques and have enjoyed a delicious lunch downtown, head to the Armory for the Festival of Trees to benefit the Chesapeake Cancer Alliance. There will be many beautiful wreaths and trees to bid on, plus gingerbread houses that will bring out the kid in all of us. The holiday calendar is full of events unique to the season and the first weekend of December is loaded with holiday cheer. The Liriodendron’s holiday open house extends the whole first weekend of December. Visitors can stop by November 30th – December 2nd to enjoy the historic mansion’s holiday decorations and to be delighted by live music and locals arts and crafts vendors. There will even be a visit from Santa on Saturday from 1-3pm. That same weekend, you can also visit the Harford Artists Gallery for their Holiday Open House for even more local artists’ work. 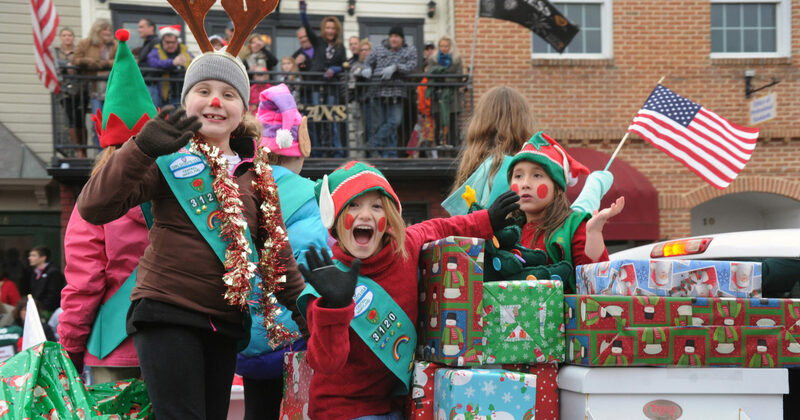 On Sunday, we’ll be breaking out hats and gloves to enjoy the annual Christmas Parade and tree lighting along Main Street with a community bonfire, hot cocoa and carols in Shamrock Park immediately following as we countdown to the Town tree lighting. Don’t miss your opportunity to see holiday concerts in Bel Air as well. From the Susquehanna Symphony Orchestra to Tuba Christmas, we have it all. With several weekends of live holiday music, it’s a great opportunity to stroll through downtown to enjoy the holiday lights or to eat dinner at one of our many local eateries before taking in the performance. Did you know that 18 shops and restaurants in the Arts and Entertainment District carry local artists’ work? Or maybe you prefer to give a gift you made yourself. If you like to embrace your inner artist this time of year, there are lots of workshops available too through many of our downtown stores. From shopping to dining to entertainment, you can take care of your entire holiday to-do list without ever leaving the Town of Bel Air. For a full calendar of events, check out the official home of Christmas in Bel Air.